My goodness, I’m really terrible at keeping this regular! A lot has happened since the last installment of Extra Staples, especially on the Field Notes front: this year’s summer edition, Byline, was released, their Chicago HQ moved, and the DC version was finally added to County Fair’s line-up. Oh, and the Commemorative Reprints (pictured above) finally shipped out this month for the subs that started with Sweet Tooth, and the special L.L. Bean edition was released out of nowhere. Phew! A thorough comparison of two new reporter’s notebooks that came out on the same day – Field Notes’ Byline and Write Notepads & Co.’s Reporter’s Notepad – from a pencil lover’s perspective. What a fun episode, with Caitlin Elgin from CW Pencil Enterprise joining the show as a special guest. If they ever throw a midnight release party, I’ll be there. And congrats to Johnny (of Pencil Revolution) on his new baby! Sometimes you need a fresh set of eyes when you’re in too deep. Sola shares her first impressions of Field Notes, with interesting thoughts on its format, and there is a ton of additional info in the comments, too. The giveaway has long since closed but this post is mostly about Mike’s journey so far (a very inspirational one at that), and I still want to say congrats to Mike on his anniversary! His blog is one of the first stationery-related ones I started following, and I’m always impressed by his dedication and passion that shine through in his writing (and awesome photography). A new post from Modern Stationer! Doug shares how he stopped looking for the perfect notebook because he’s had it all along (in this case, Field Notes), and how he’s simplified his journaling workflow. Simplifying is not easy to do, so I admire his will to do so and to embrace it. I swear I’m not including this post just because my blog is in it. I’d already decided I would mention it, even before I finished reading it. I enjoy this type of post because it’s a good reference point. I get to discover something new, and also get to know the person who compiled the list. Don’t forget to check another fantastic post from The Finer Point: My Journaling Habits. And congratulations on your growing family, Jenny! Adding a new gray ink to my small collection of fountain pen inks! I'm beginning to like eraser-tipped pencils, and these caps have been a qood solution to my untipped pencils. I'm not a fan of baseball at all but I still like the look of this newest offering from Palomino. Whaa?? It’s a solid block of real gold in the same shape (and size) as the popular Tombow MONO eraser. I guess only 3 were made in celebration of the release of MONO Air (correction tape). You enter the giveaway by submitting the correct answer to a question here, and they’ll select 3 winners by lottery. No, I didn’t participate; I believe you have to be a resident of Japan. Good luck...? Coming up very soon! And OMG, Director Shunji Iwai will be a special guest at this year’s JFFSF. I am crushed I will not be able to make it to his Q&A after the screening of his new movie, A Bride for Rip Van Winkle. Other films I’m excited about: DASHI & SHOYU: Essence of Japan, and Rurouni Kenshin: Kyoto Inferno. I got a tour of this exhibit, and it was fascinating. Must go back and absorb at my own pace! Yup, I made my own erasers for Palomino Blackwings. I like these pencils, especially the Pearl and the vol. 211, but I don’t like the erasers that come with them. They’re decent. They get the job done. But I prefer softer erasers. So I took some soft (and cheap) erasers and cut little blocks out of them that could fit into the Blackwings. 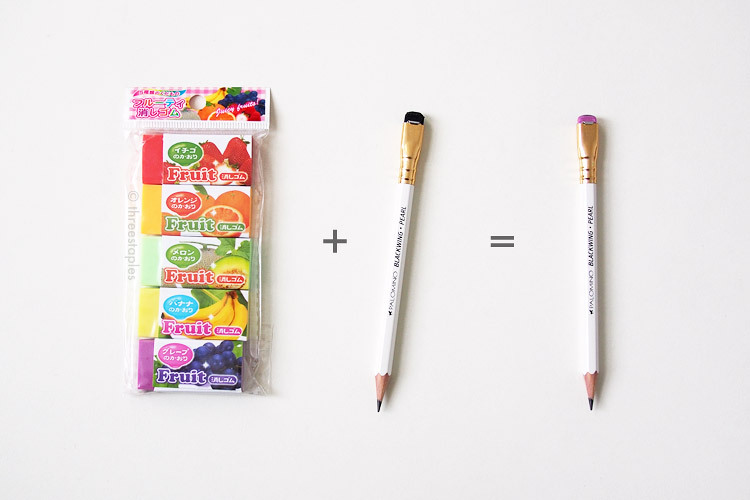 Voilà, custom erasers. I had to make the new eraser shorter than the original (which is about 21 mm) because of its softness. I learned that when it's as long as the original, it bends too much when I put pressure on it and is harder to control. In other words, it requires more support from the metal holder. You can tell I like the Pearl a lot. 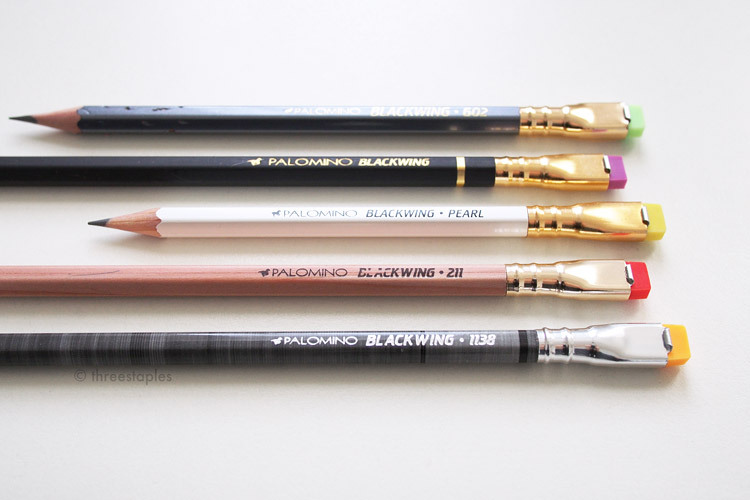 Do you like the Palomino Blackwing erasers? Do you ever switch them out for more colorful options? 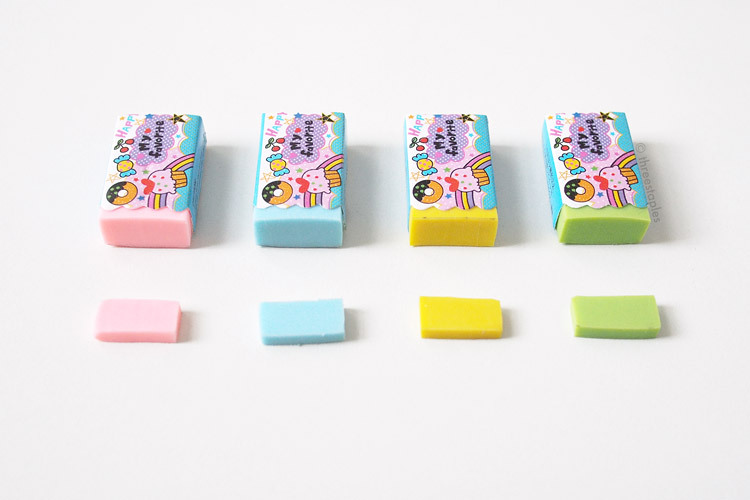 I’ve only seen the black and white replacement erasers in stores but I see that they are also available in pink, orange, green, blue, and red online.